Sorry for the delay in posts! With public health warnings regarding the intense heat in Southern Ontario it has been difficult to get much work done in the garage. I have certainly worked in worse heat and humidity, however I am not on a tight deadline and feel no need to wipe sweat from my brow! As far as the Bridgestone goes, I have gathered plenty of small pieces and will be making a visit to the powder coating shop early next week. My barrels and cylinder head (s) are being soda blasted as we speak and I have a little pile of parcels containing NOS parts to open up. While I am on this little mid week break, I'd like to do a quick product review. In May, I needed to do a little metal cutting that was on the fine side. There was no way the angle grinder would cut it, so I needed another solution. After cruising around the hardware store I found a rather neat Dremel (or Dremel equivalent as I have) kit. 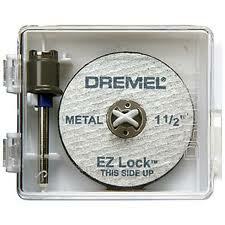 This EZ lock system is quite small and at $24.99 for 5 discs I was skeptical. I took a chance as I needed the job done that evening. The loading of these is quite simple and quick and I have to say I was impressed by how long the discs lasted and by how well they cut through thick steel. The other benefit is being able to cut curves and angles that would not be possible with a wider blade. Do yourself a favour though and wear safety glasses. The sparks and tiny shards will fly up into your face. I also advise that you pause after a minute or so rather than cutting continuously. My experience was that the discs tend to last longer this way. I give it 4 out of 5 stars, 1 being lost for the price...$5.00 for a disc the size of a quarter seems a tad much. Other than that gripe, it's a great tool to have in your arsenal and doesn't take up much space in your toolbox. That is it for today, stay cool, hydrated and ride safely!